February 15, 2012- Tonight's Daily Nail is the one you all have been waiting for - your seasonal nailgasm. 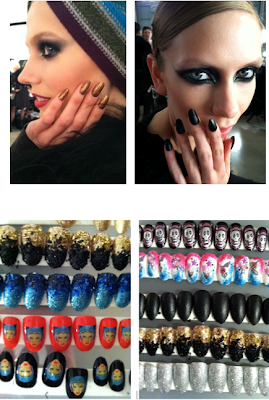 Take a breath, and grab a glass of wine while we take you to a manicure moment with The Blonds. 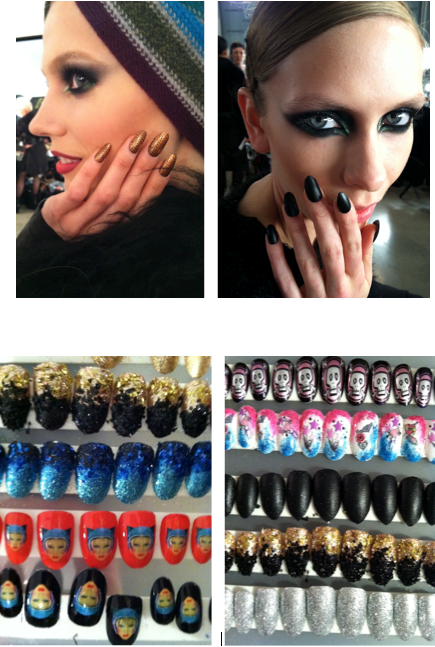 At The Blonds, CND's Kristina Estabrooks and her team spent 130 hours hand detailing biker babe manicures. No nail set was alike - crystals, glitter, leather, Phillipe Blond faces, crushed glass shards and acid washed denim designs were just a few of the styles to grace the runway. At Milly, CND's Candice Manacchio created a "Navy Nail" with two coats of CND Colour Midnight Sapphire. This manicure accessorized hyper femme layered jackets, voluminous mini skirts and pops of pink, yellow and cobalt blue.